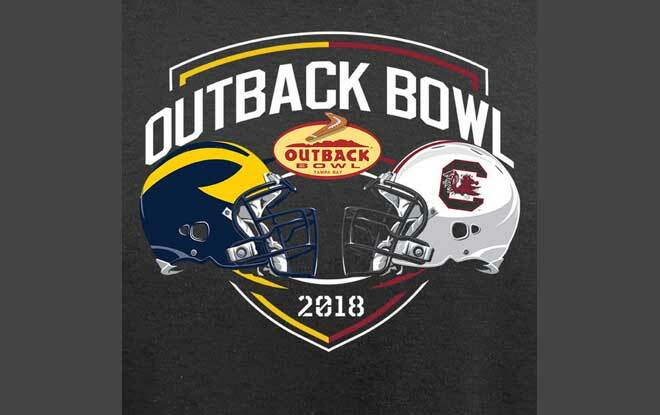 The first of the New Year’s Day bowl games takes place in Tampa, as the Michigan Wolverines take on the South Carolina Gamecocks in the Outback Bowl on ESPN 2. These teams actually met in the Outback Bowl after the 2012 season and it was South Carolina winning 33-28. This year’s game may not be as exciting, as these two teams play tough defense. The Wolverines are listed as 7.5-point favorites in this contest at sites that offer the best sportsbook reviews. Both Michigan and South Carolina went 8-4 this season. Neither team has a potent offense, but they both have tough defenses. Michigan has had very little success throwing the ball, so they will rely heavily on running back Karan Higdon. He led the team with 929 yards and Michigan was third in the Big Ten in rushing this season at 186.3 yards per game. It should be a good matchup, as South Carolina features All-SEC linebacker Skai Moore who led the team with 88 tackles. On the other side, Michigan features linebacker Devin Bush and he will be looking to control South Carolina quarterback Jake Bentley. Busch leads a Michigan defense that was third in the Big Ten in scoring defense, allowing just 18.3 points per game. Bentley threw for 2,555 yards and 16 TDs this season. South Carolina finished second in the SEC East behind Georgia this season and two of their four losses came to teams in the College Football Playoff, Georgia and Clemson. Many people at sites that offer the best sportsbook reviews don’t see anything other than a low scoring contest. It is hard to see how this will be anything other than a defensive struggle, as South Carolina was 98th in scoring at 24 points per game, while Michigan was 86th at 26 points per contest. South Carolina head coach Will Muschamp fired offensive coordinator Kurt Roper earlier this month and it will be wide receivers coach Bryan McClendon calling plays. Michigan and South Carolina have played three times previously, with South Carolina winning two of the three. The Wolverines are 3-2 all-time in the Outback Bowl. They are 8-5 all-time against SEC teams in bowl games. South Carolina is 3-1 in the Outback Bowl. The Wolverines are 4-10 ATS in their last 14 games on grass. The Wolverines are 1-4 ATS in their last 5 non-conference games. The Gamecocks are 5-0 ATS in their last 5 neutral site games. The Gamecocks are 4-1 ATS in their last 5 bowl games. Sites that offer the best sportsbook reviews show that the Gamecocks are 2-6 ATS in their last 8 non-conference games. The Over is 6-0 in the Wolverines last 6 vs. the SEC. The Over is 8-2 in the Wolverines last 10 Bowl games. The Under is 8-3 in the Gamecocks last 11 games overall. Why is Michigan laying more than TD in this game? Could it be due to reputation more than talent? This looks like an even game on paper in which both teams will struggle to score. Taking the points looks to be the way to go with South Carolina and playing the under also looks good at offshore gambling sites.